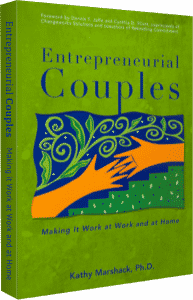 Entrepreneurial Couples – Kathy J. Marshack, Ph.D. When you work in a family firm, whether you are an entrepreneurial couple, or part of a business venture that includes parents, grandparents, siblings, cousins, and in-laws, the most important thing to remember is that family always comes first. When I help the family get stronger, resolve their interpersonal conflicts, and help individual contributors become more authentic, the business thrives. Other business consultants are often stymied by this reality, but I think it is a strength. For example, family first makes perfect sense when discussing succession planning. It’s a very emotional endeavor to get the next generation ready to assume the reigns of leadership. It has to be handled in a way that is respectful of the founders and their mission, but at the same time making room for the energy and new ideas of the second, or third, or fourth generation. As a psychologist, well versed in the power of family dynamics, my goal is to help entrepreneurs make this transition smoothly. I have worked with all manner of family firms, in a variety of industries from construction, professional groups, retail, trades, even farm families. One type of family firm that I especially like to work with are entrepreneurial couples. After all, most family firms started with a “Mom and Pop” operation. I even wrote the book on these folks! The number of couples choosing the entrepreneurial lifestyle is growing at a phenomenal rate globally. Not only do they wrestle with supporting each other in the business, they are juggling childcare, housekeeping, and trying to keep their own personal relationships vibrantly alive. It’s a fulfilling lifestyle for many but it also creates new challenges. As Freud said, there are two things in life that are of utmost importance to adults, Love & Work. There is no better example of how these priorities blend (and clash) than with entrepreneurial couples and families in business. Certainly this is one of the most complex of lifestyles. One way to get started on renewing your commitment to Love & Work is to order my book, Entrepreneurial Couples: Making It Work at Work and at Home.